As you can see from the photo, you get your potato side in the overall cooking time. The potatoes will protect the fish from getting direct heat. Add some buttered green veg, broccoli, beans or similar and you've got a really easy meal. I promise, a child could do this cooking! 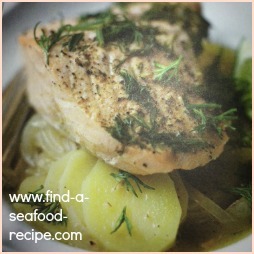 For more fillet of salmon recipes, go to the bottom of this page where you'll find links for different methods. An overall tip is that you need ten minutes cooking time with direct heat per inch of fish - pan frying is perfect as you can seal in the moisture quickly. Brush the slow cooker with half the butter then layer the potato and onion on the bottom. Sprinkle a little salt and pepper between the layers as you go. Add the stock/water/wine and the rest of the butter. Cover and cook on low for around 3 hours until the potato is soft. 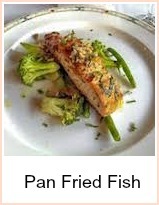 Remove the lid and add the fish in a single layer - try not to overlap. Pour over the lime juice and zest and a few twists of black pepper. Sprinkle the dill over and cook for a further one hour or so. 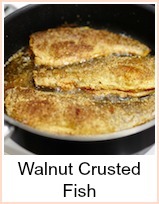 The fish will be firm to the touch when it's cooked and should flake easily. It 'steams' over the vegetables and will be extremely succulent - this cooking method would work for most fish and the timings will be around the same. They are all really easy and super quick. Get your sides ready before you start to cook as it will happen so quickly at the end. Have hot plates so that things don't cool off too quickly. 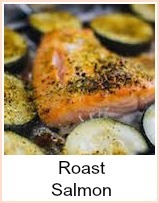 A method of cooking salmon fillet in the slow cooker or crockpot. Really easy and the majority of the cooking time is potatoes - a virtual one pot meal.